Go on, get it out of your system: bling. 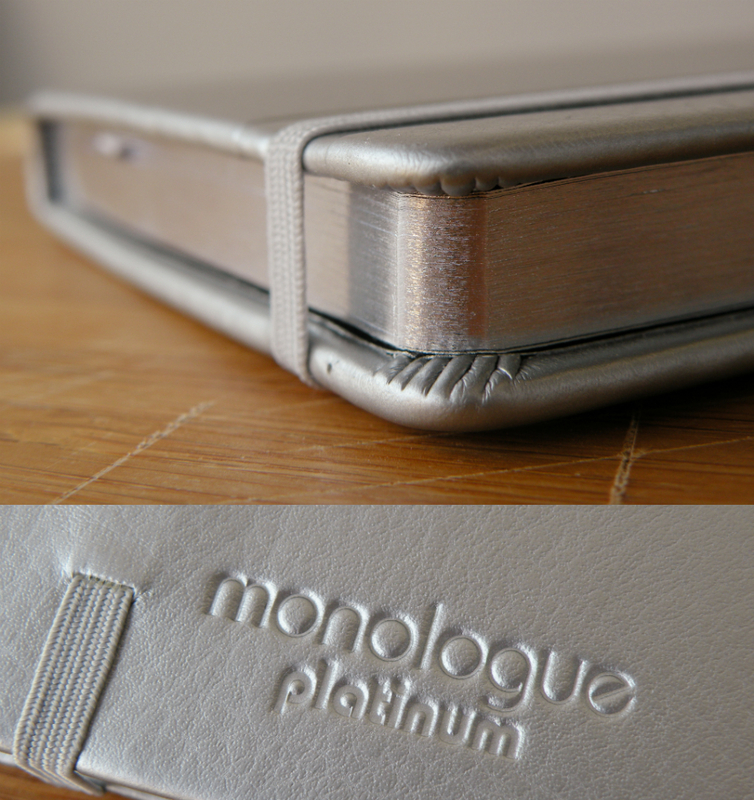 The Monologue Platinum is about as blingtastic as a notebook can get without incorporating precious gems, rhinestones, glitter, or spinners (not gonna lie, I’d buy a notebook with a little spinner rim on the cover—SOMEONE MAKE IT HAPPEN). 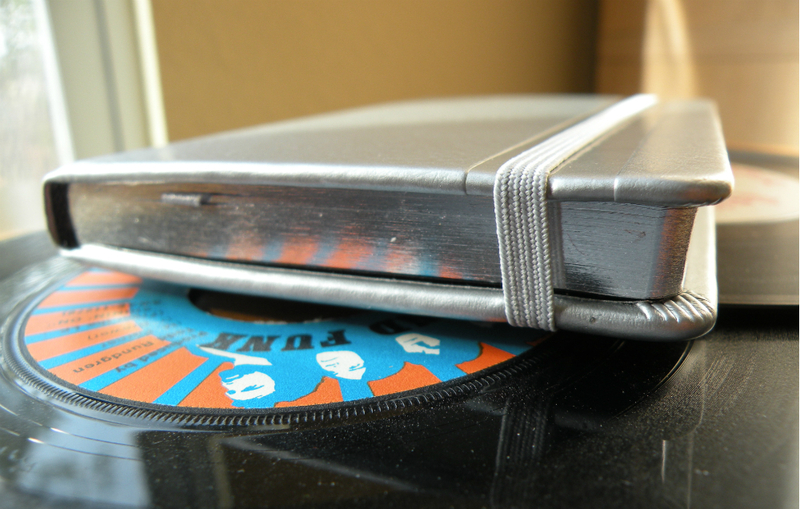 Metallic silver cover. Silver bookmark. 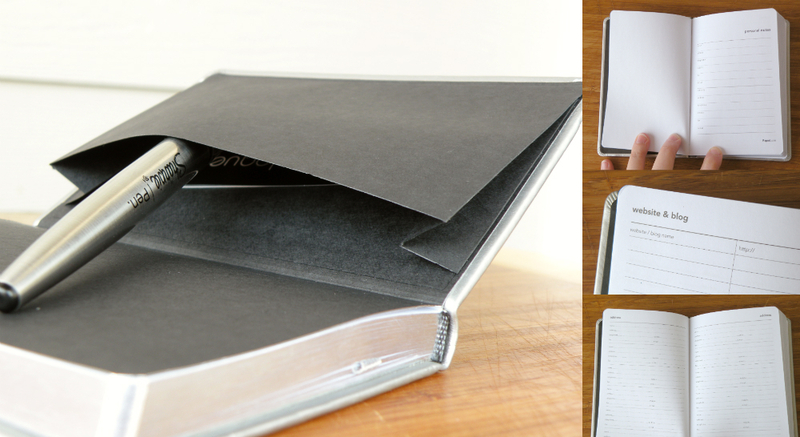 Silver (or gray really) elastic closure, fabulous silver-edged pages. It’s got bling without shouting you down. 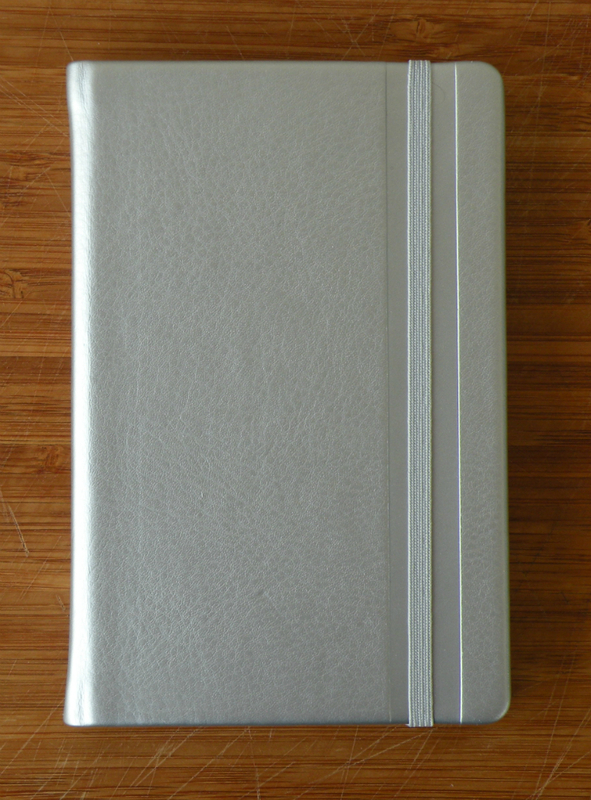 The front cover has a smooth, pressed down section to keep the elastic from biting so badly through the cover like it does on the regular Monologue Ruled Notebook. Take note, Rhodia, it might be worth a try (or a prototype? wink wink my mailbox is open). In terms of extras, you’ve got a whole page for your contact information, a section for addresses, and even some pages for websites and blogs. Who even knows people with that many blogs? There’s also a back pocket, which is only really important when a notebook doesn’t have one and you need it. These lines are tight. Is miniature college ruled even a thing? How do you even fit 25 lines on an A6 page?? This is crazy. The paper (80gsm) is way too absorbent for fountain pens, but at lines this tiny you know you gotta go with microtip gel pens. Once again, I highly recommend the Pilot Juice 0.38mm—my dark red Juice is doing wonderfully on this paper. But anything 0.5mm and under would look great. And with all these lines per page, you can fit more writing in. 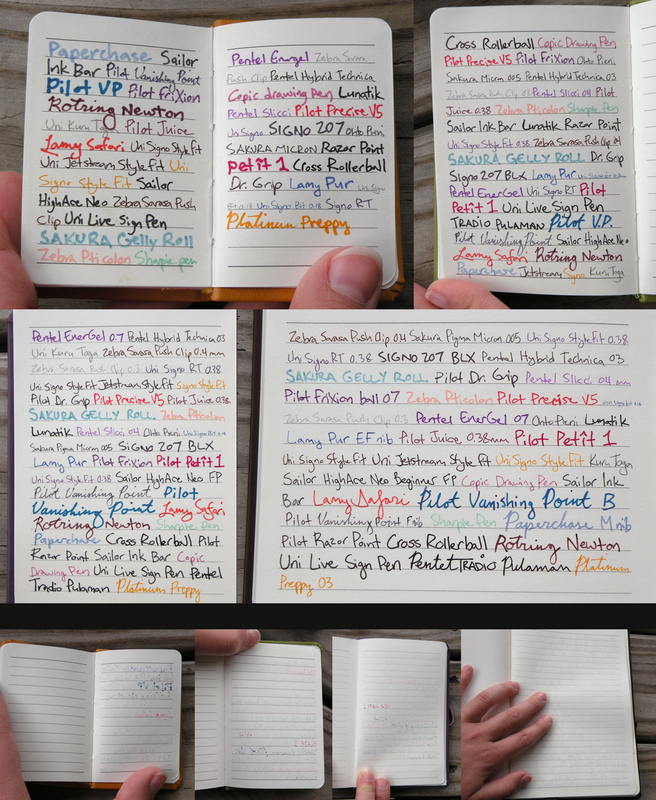 You want more lines in your pocket notebook? You want something that stands out a little? 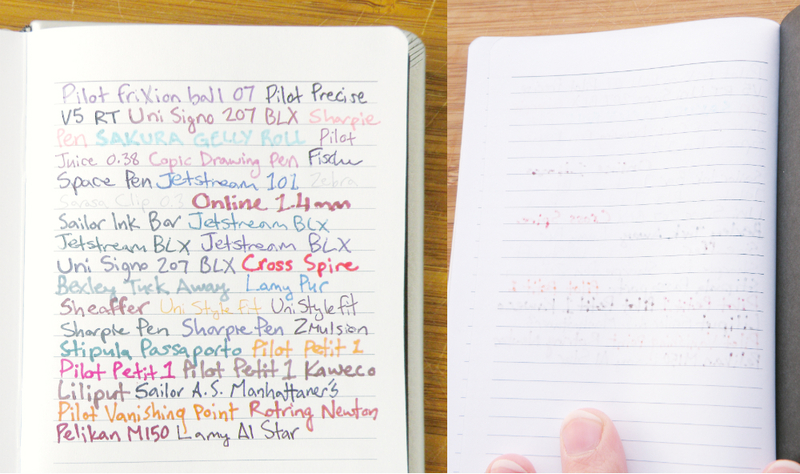 You want another notebook dedicated to your micro-tip gel pens? Here it is. Bear with me kids; I’m still getting the hang of this picture editor. On the plus side, since it doesn’t do resizing by percentages, every picture is now maximum of 1000 pixels. Allegedly, this is a soft sketch book, and technically speaking yes, this is a soft, not hard cover on this book, but you will not find a stiffer notebook for your dollar without falling down a rabbit hole of double entendres. How am I supposed to use a notebook I can barely even open? Step one, crack this book like a winter walnut. I like the texture of this cover, and the size of the notebook. I’m a fan of small portable notebooks for my doodles. I’m not, however, a big fan of horizontal elastic closures, but this one seems to get out of the way pretty easily. That’s just a general preference issue on my part. Maybe I should have just scanned these. Not that it really lays flat enough for that. Oh well. The paper is the same good heavy-duty paper as found in the Monologue Orange Sketch Pad, meaning it’s great general use art paper. And once you go through and crack the spine it isn’t so bad. 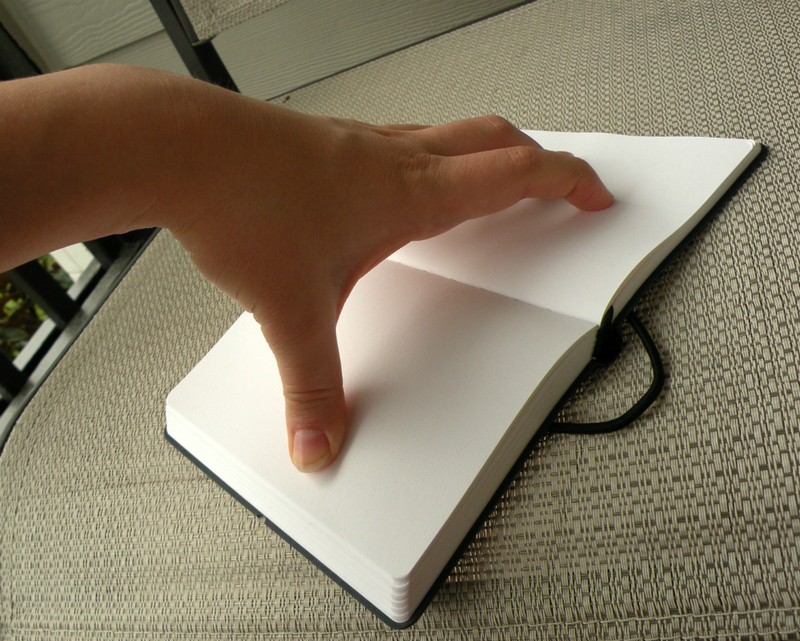 It works for me because I can rest my hand on the left side of the pages to draw, and it keeps the book open. It still doesn’t want to lay remotely flat on its own, instead choosing to settle itself into something like an acute angle. This is as far as it shuts itself. Elastic band required for full closure. 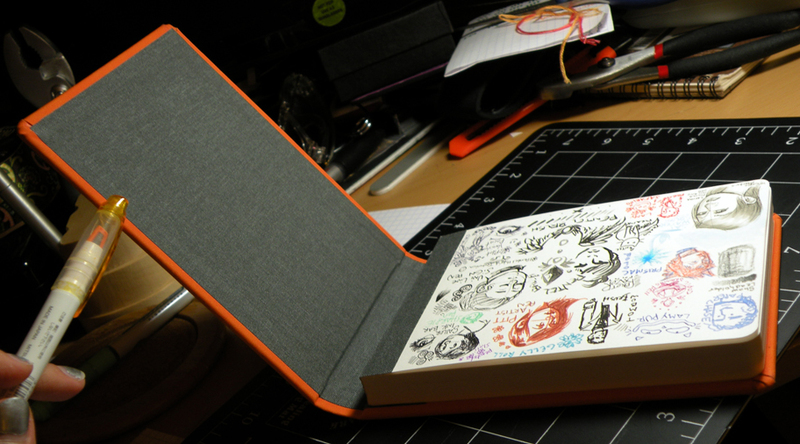 With the elastic band, I’m definitely more comfortable throwing this sketchbook in a bag. And I like the paper. 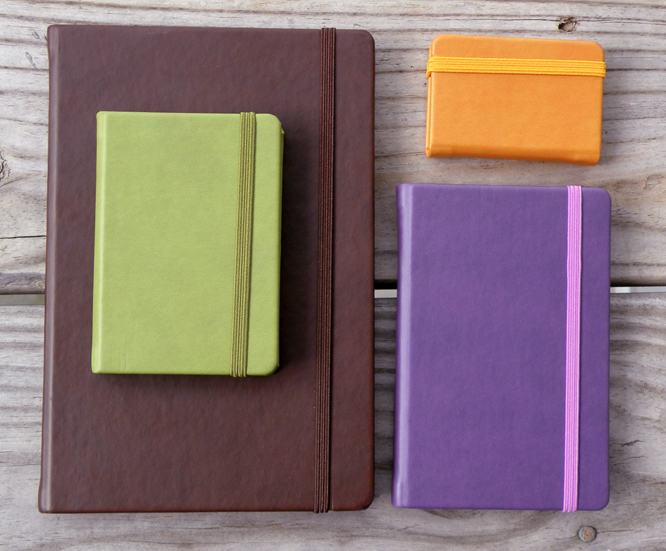 Just get past the stiff spine, and you’ve got a stylish little sketchbook to use. Thanks to Grandluxe for providing this sample. 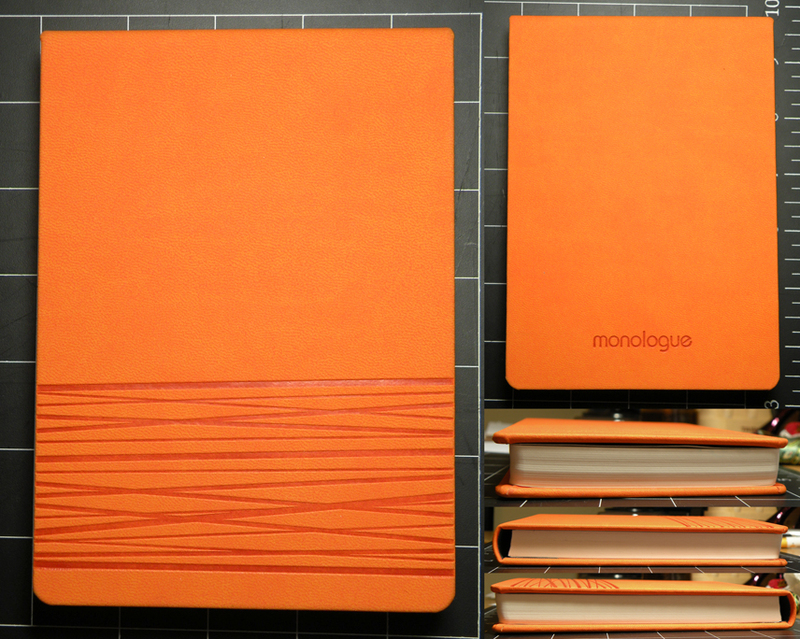 On appearance, the Monologue sketch pad is getting a lot of things right—love the warm orange paired with grey cloth interior, and this striking minimalist design (pressed? embossed? cut? spellcast?) on the cover. The cover (suede polyurethane) isn’t standard smooth polyurethane; it feels like imitation cloth…which is beyond my understanding as to why the feeling of cloth would be one to imitate, but here we are. That’s art. I don’t like the free-floating factor of the front cover—I can’t in good conscience just toss this sketch pad in a bag because there’s 100% chance something else in the bag will push the cover askew, which can’t be good for it over time. 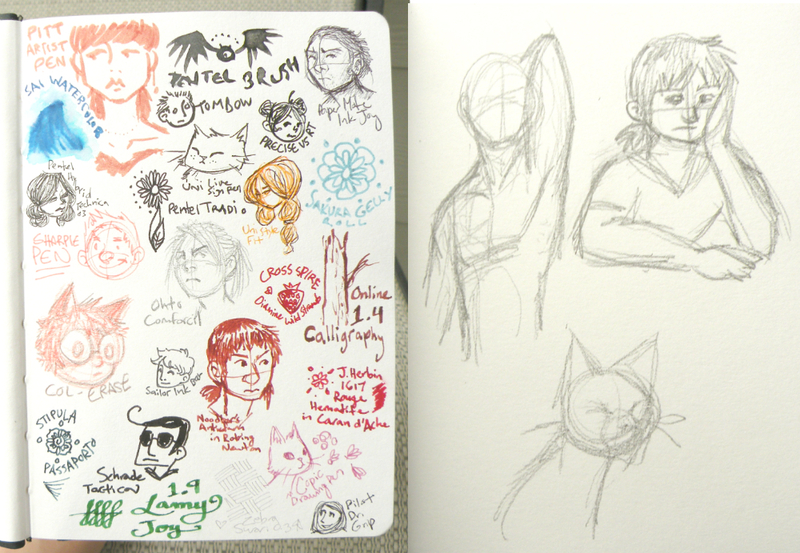 The main sketchpad seems well attached, and the way it’s designed the pages lay nice and usably flat. But how is the paper? The paper, according to Grandluxe: 140 gsm Italian acid free rough textured drawing paper, surface treated with vegetable gel, Suitable for drawing with the following techniques: Charcoal – Chalk – Graphite – Pencil – Pastel – Oil Pastel – Wax Crayon – Red Chalk – Acrylic – Collage – Oil – Marker – Spray – Tempera. No worries! It does great for an all-purpose sketch paper. The only bleedthrough was from using Copic markers (which still look good on the page, just can’t use both sides). 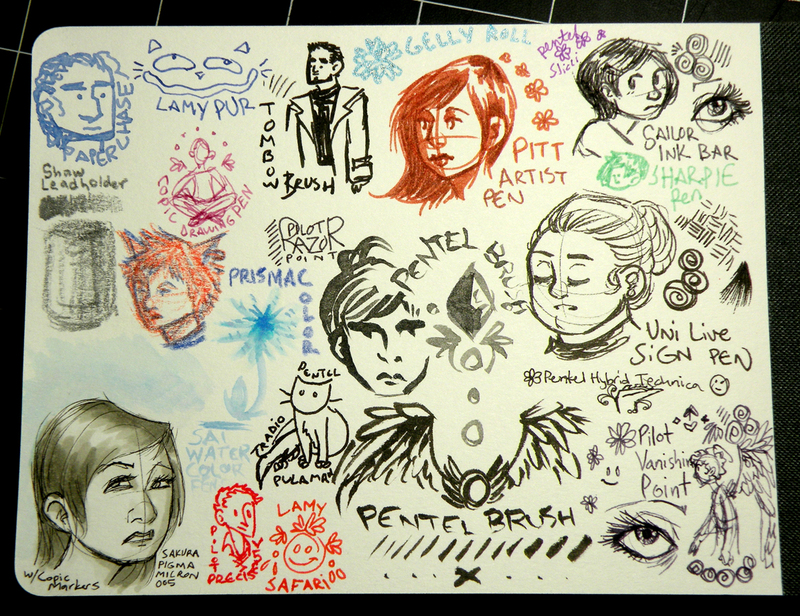 Everything else, from fine pens to watercolor to pencils and more, did wonderfully. The paper has some tooth to it, you can see, but not so much as to get in the way of using any of the pens. Good art paper all around. Some people hit the open road. Some people hit the open sketchbook. Though I’ll worry about inadvertently tearing off this unsecure cover over time, the quality and usability of this paper ensures that I will be still using it until the cover falls off. Thanks to Grandluxe for providing this sample! Four notebooks all at once! We can do this! 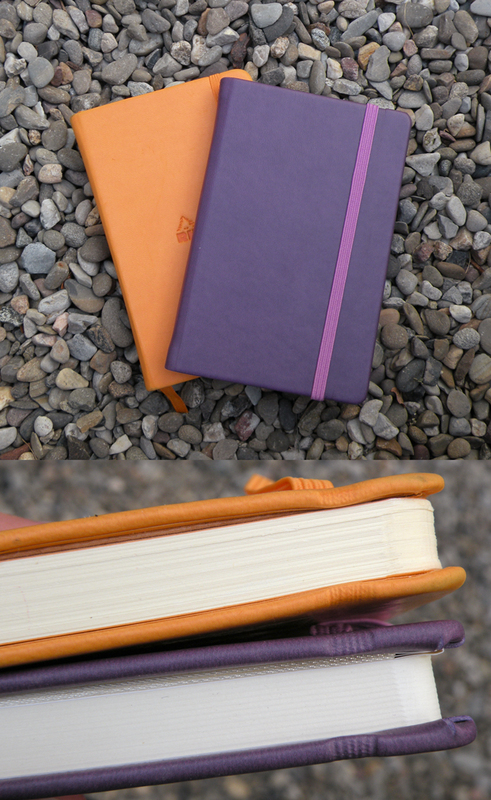 The obvious comparison to make for these notebooks is the Rhodia Webnotebook, so let’s go ahead and get it out of the way. Where the Rhodia Webbie only comes in A5 and A6, the Monologue ruled notebooks come in A5, A6, and the even smaller A7 and A8. 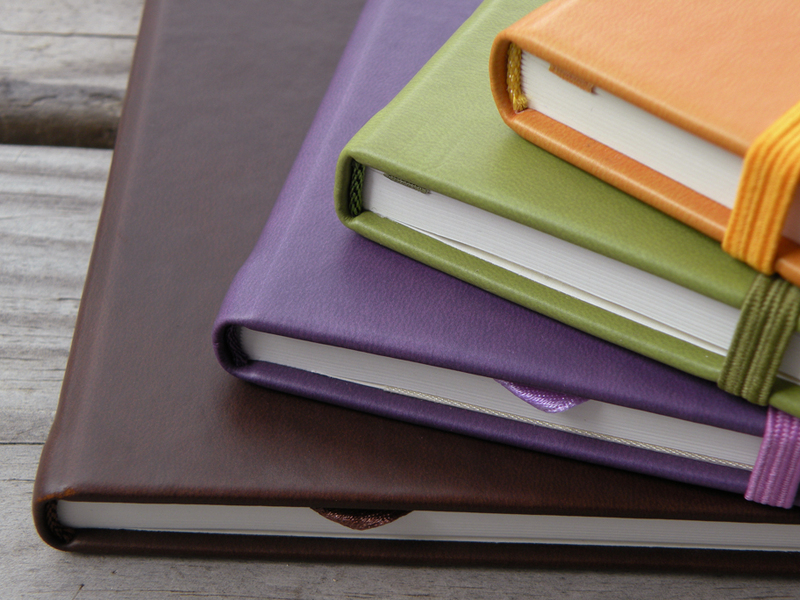 They all have the same basic design: a soft-to-the-touch hardback leatherette/polyurethane cover, with strong elastic bands pressing dents in the top and bottom of the cover; silk ribbon bookmarks and back pockets. And they’re both filled with paper (a quality point of some significant divergence between the two). In terms of the outside, they’re nearly equivalent. It’s almost impossible to tell if the Rhodia or the Monologue has a smoother cover; I’ve sat here for several minutes rubbing notebooks on my face and I still can’t make up my mind. 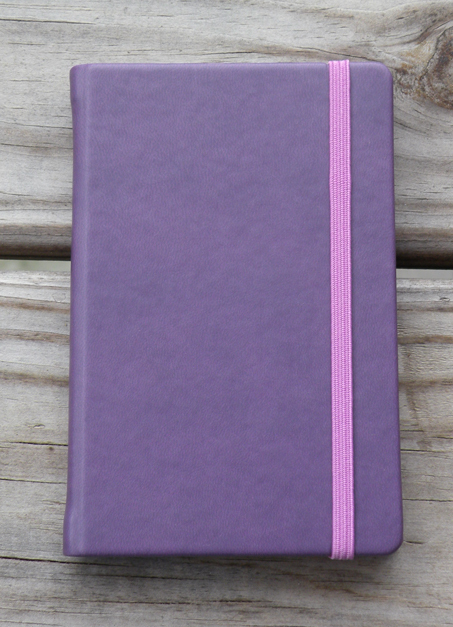 The color of the four notebooks I received are fantastic for the start of fall—the A5 is a warm brown that falls somewhere between milk chocolate and 70% cacao; the purple is a lovely shade that looks pretty close to such impressive-sounding Wikipedia-defined hues as royal purple or pomp and power, with its elastic band a striking lighter shade (I’d hazard a guess at an actual color name, but I’m getting tired of squinting and holding the notebook up to the screen). The olive green A7 is a good color to hold onto—a last bit of verdancy before the leaves turn warm and start to fall. And the palm-sized goldenrod yellow A8? I can practically smell the bonfires and taste the long-awaited pumpkin spices, this color is so perfectly autumnal. A funny thing happens with the Monologue notebook series—the bigger the notebook, the better it’s able to handle liquid ink. 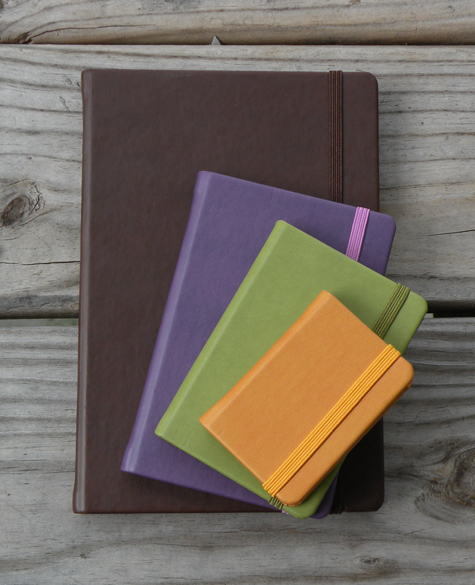 There’s no immediately obvious reason WHY this is the case; all four notebooks claim to contain 80gsm cream-colored acid-free paper. It’s not how big or small I’m writing; writing large in the little notebooks with a broad-nibbed fountain pen still looks terrible. I don’t know what to make of it. The wee A8 is hemorrhaging ink through the page so bad I’ve got half a mind to call an ambulance for it, while the larger A5 is letting this broad-nib Vanishing Point lay down crisp lines with only minimal showthrough and only an occasional dot of bleedthrough. It’s negligible enough to comfortably use both sides of the page. Dry time is good—beginning of a line is dry before I get to the end of the line. How is the A5 doing this? Why doesn’t liquid ink do well in any of the others? Is it magic? I am both confused, and impressed. Too many words. Better break things up with pictures. 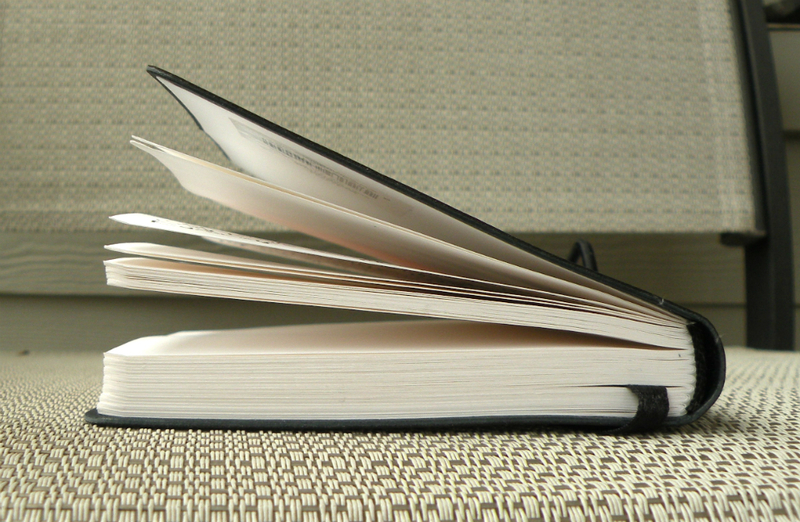 It’s difficult to review in aggregate a set of notebooks whose paper behaves differently depending on the size of the notebook. I would be interested to know if these differences I’m seeing holds true across multiple other samples and other peoples’ experiences. I’d like to make some recommendations anyway, based on the performance of the notebooks I’ve got. 100% fountain pens. They do so well, why not use them? Unless you don’t like fountain pens, in which case I’m making funny eyes at you. This paper did well with every kind of writing utensil except for the Pilot Petit 1, which I’m starting to realize does uniquely poorly on many kinds of paper. Though you could really use any pen with this notebook, for me it will be exclusively the domain of the fountain pens. The purple A6 is the limit when it comes to fountain pen use—and even then I would only advise very fine Japanese nibs. And even then, when you look very close you can tell that the lines aren’t perfect. You start to get fuzzing, you see more spots of bleedthrough. 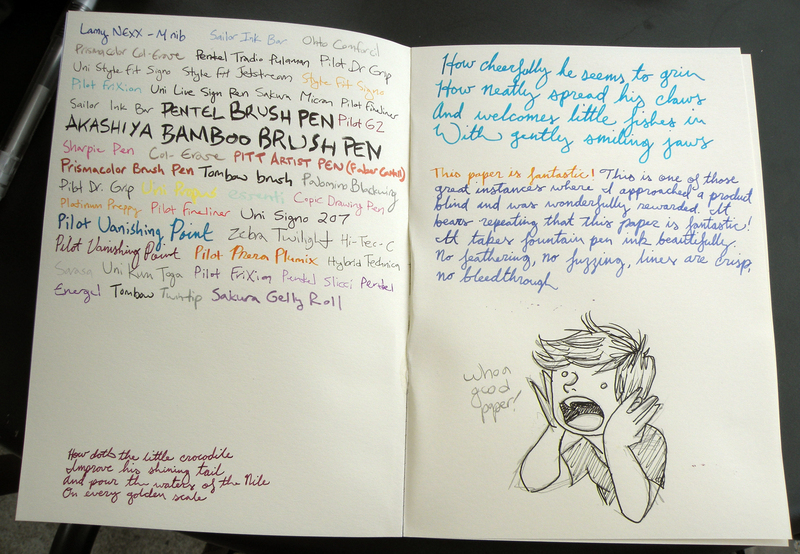 So really, I wouldn’t recommend fountain pens at all in this notebook. 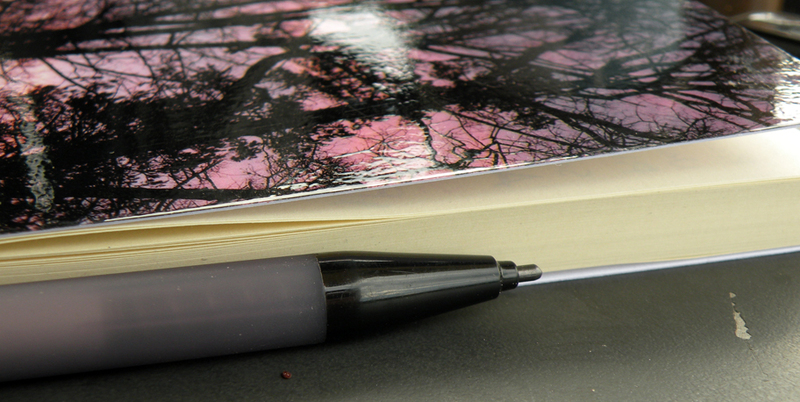 For this notebook I’m feeling super-smooth ballpoints and brightly-colored broad gel pens. This notebook is a good pocket size that’s still big enough to jot down a short story, and for that, I want a pen that flows. The A7 is a bit too small to write out big chunks of prose. This size—a size that actually fits easily in a back pocket—is more suited to an everyday all-purposes notebook, or perhaps good for poetry. 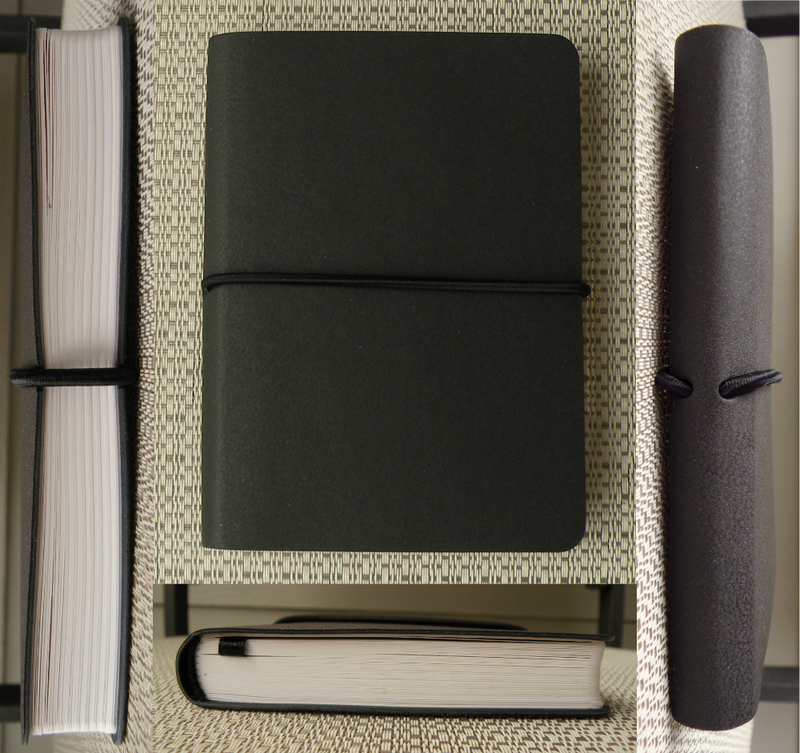 It’s small enough to blend into an everyday carry, while still having enough space to fit a thought on the page. For this notebook, I’d stick with gel pens and ballpoints 0.5mm or lower. I’m particularly loving the look of my 0.38mm dark red Pilot Juice on this paper—it’s perfect for this notebook. 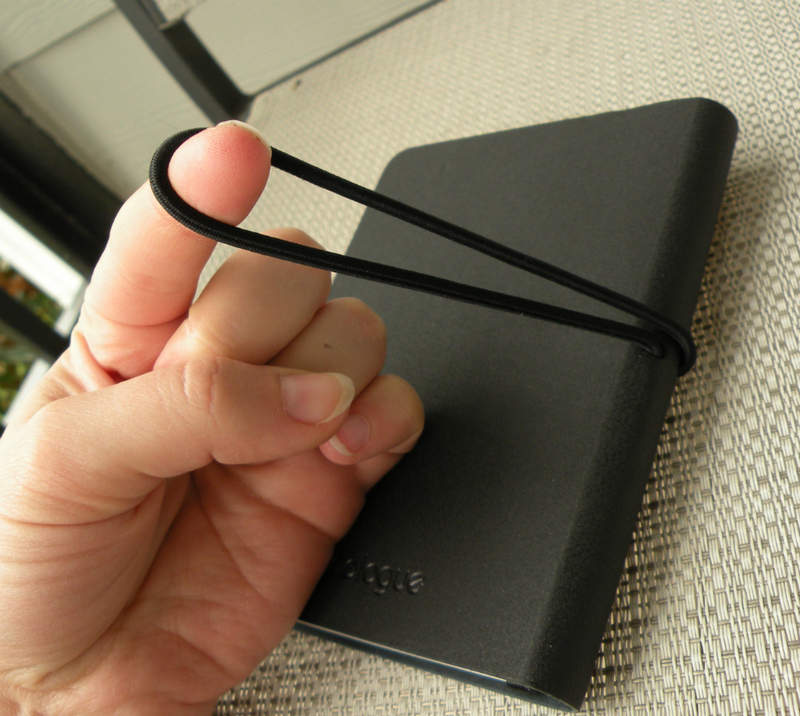 If ever a notebook was made with micro-tip gel pens in mind, it’s this ridiculously tiny notebook. I love miniatures. You want me to impulse buy something? Put out a tiny version of it. This is undoubtedly, adorably the smallest hardcover notebook I own. Pretty sure it’s small enough to qualify as a choking hazard (if your child has a big mouth or is a hinged-jawed python). 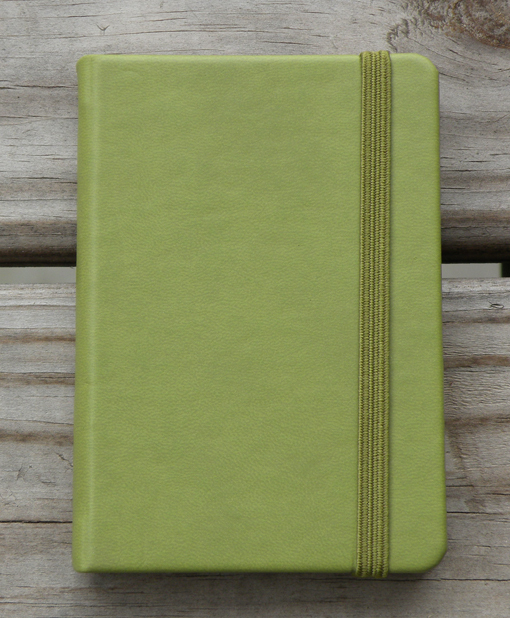 This is the only notebook without a back pocket (but what would you put in it, stamps?). 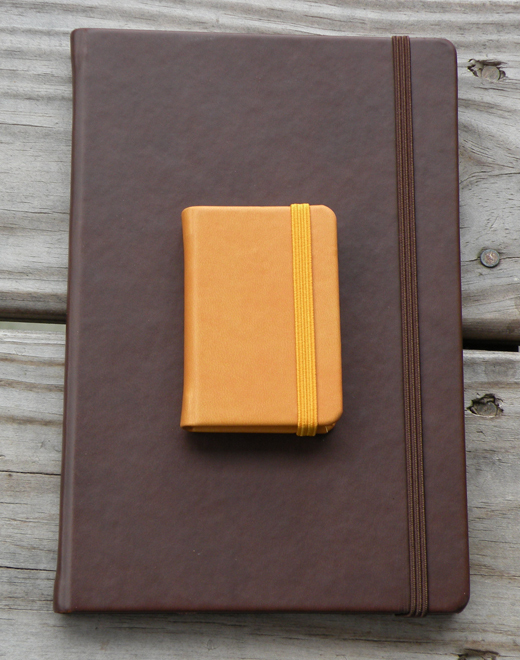 If Rhodia and Moleskine had a baby, it would be this little notebook: smooth cover and fountain pen unfriendly paper. Bust out your absolute smallest micro tip gel pens—and ballpoints if you have them—and write the tiniest thoughts you can think. Might even be worth getting your hands on a Uni Signo Bit 0.18mm. 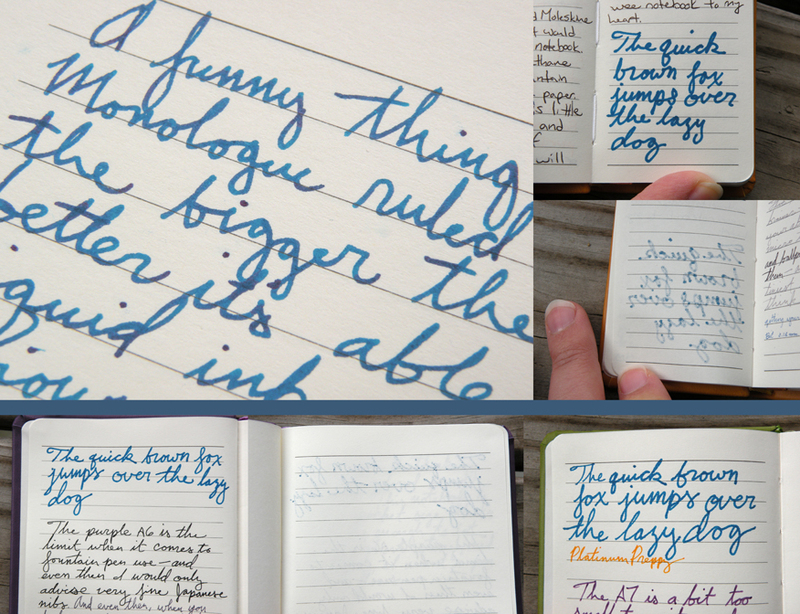 Ultimately, the overall Monologue line of ruled notebooks can’t compare on paper quality to the Rhodia Webnotebook, but then, the Monologue is in a whole different price bracket. And especially if you’re not among the fountain pen obsessed like I am, and regularly do your writing with ballpoints and gel pens, and are looking for that leatherette-feel without paying fountain-pen-paper prices, you might look into the Monologue Ruled Notebook. 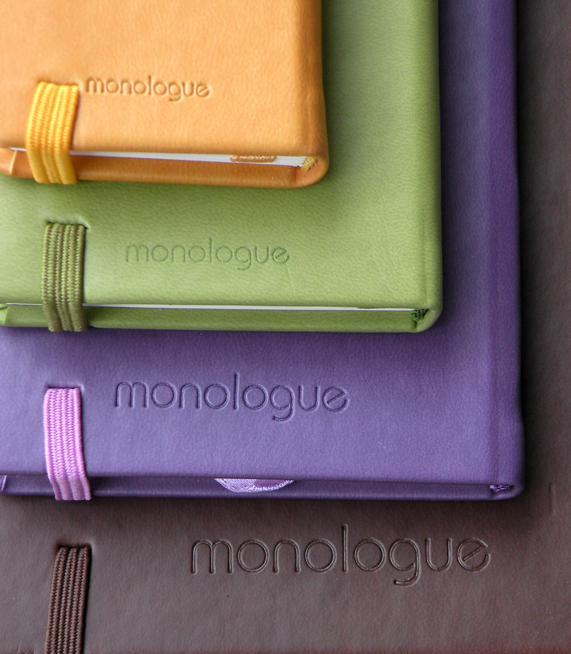 Monologue Ruled Notebooks are carried in the Grandluxe online store, and on their Amazon store. And they have their own Facebook page, if that sort of thing appeals to you. One of my favorite emails to get is when a company approaches me out of the blue and offers me a product for review. Part of me worries for them a little bit, because I have high office supply standards, and I’ll feel bad if it turns out I hate whatever they so nicely offered me, or if it has some major terrible flaw (like a notebook with terrible paper (this has happened before, I contacted the company about it, that review remains in limbo)). LUCKILY FOR EVERYONE, THIS WAS NOT THE CASE HERE! So I can thank Bags of Love for providing this sample without any reservation. Front, featuring a sunrise from my bedroom window. Back, featuring a sunset in Morocco. Both sides featuring reflection self-portrait shadows! The way this company works is they take photos you upload to the site and make personalized gifts—in this case, a notebook. This only narrowly avoided being a notebook of my cat; the pictures I had taken with my real camera of a sunrise out my bedroom window and a sunset in Morocco were better quality than a thousand iPhone cat pictures. 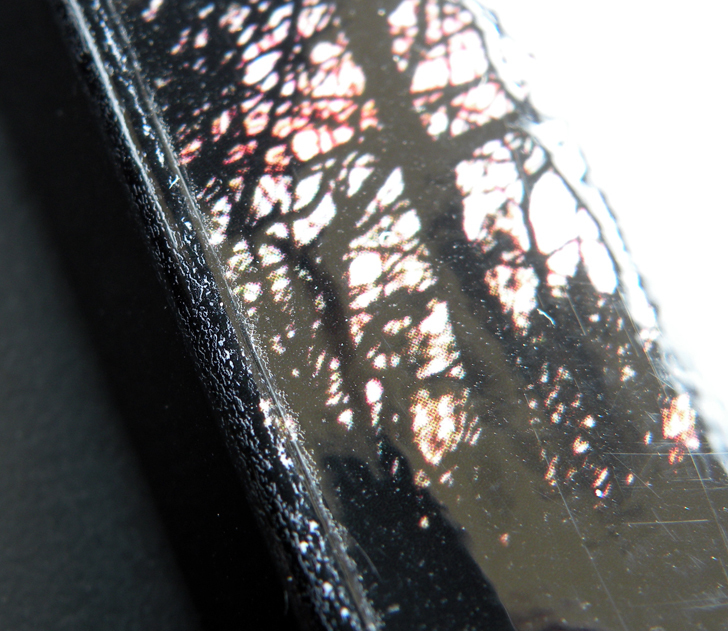 The notebook is a glossy soft cover. It looks beautiful and you can touch it all you want. The photographs I used turned out wonderfully, with solid blacks and rich colors, just as they looked on my computer screen, and the design/upload interface on the website was easy to use. The downside to it being a soft cover though is I just know these corners are going to get dinged up, and the spine will end up creased and lined like any paperback. Crease damage to top of spine. Typical for paperback books. Now for the good news. No, the fantastic news. THIS PAPER IS WONDERFUL. I had no idea. I didn’t have the slightest clue going in. I looked at the cream-colored, unlined paper and braced myself for enough feathering to cover an outdated dinosaur model and enough bleedthrough to designate the notebook a crime scene…and got none of it! Not the slightest fuzz! Even my broad nibbed Pilot Vanishing Point, which throws down ink like it’s going out of style, it was able to handle with ease. You can somewhat see the shadow of the previous page’s writing, but nothing so bad that it would stop me from using both sides of the page. 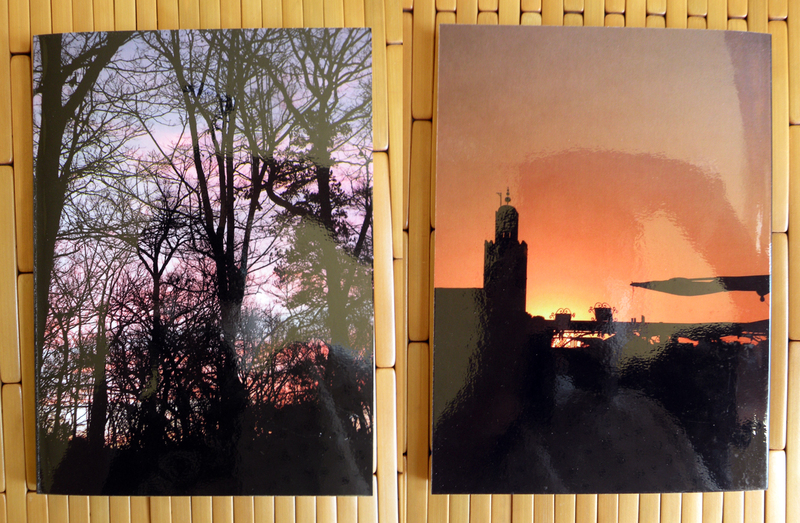 I got the A5 size (8×6″), but they also offer A6 (6×4.5″) notebooks. Says it’s got 150 sides of paper…I don’t feel like counting. I can tell you it is a decent but manageable amount of paper. I don’t like a notebook with too much paper, because then it’s too heavy to carry around in a casual bag. And being unlined, I can use this notebook for writing OR drawing. Price-wise, this is definitely a case of getting what you pay for. 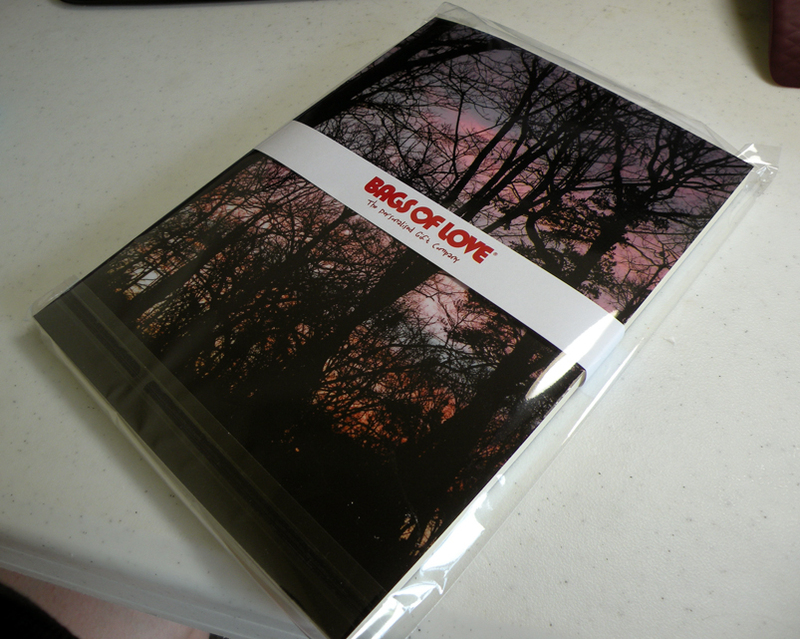 This is a high-quality custom-cover notebook. Something from, say, CafePress would be cheaper, but have you ever actually ordered things from CafePress? I have. I got a custom shirt so poorly made that the shirt pieces weren’t properly aligned when it was sewn and there was a hole in the side of the shirt. I have a friend who ordered a custom SIGG water bottle and received a cheap knockoff. Maybe those kind of shenanigans fly when you’re trying to make custom things for yourself, but you want a gift for someone? Bags of Love is going to give you a quality product that you won’t have to be embarrassed about when you give it. And they are capable of some CRAZY fast shipping if you need it. I don’t know how much it costs, but this thing was in my hands all the way from across the Atlantic Ocean within 24 hours of my being notified it had shipped. Freshly wrapped! Even on an unattractive plastic table it looks lovely! Good paper is worth its weight in gold to me. This notebook is full of good paper. My only complaints are those which plague the very nature of all paperback notebooks. This is a solid product, and I would gladly spend my own money with Bags of Love. Thanks again to them for providing this sample!